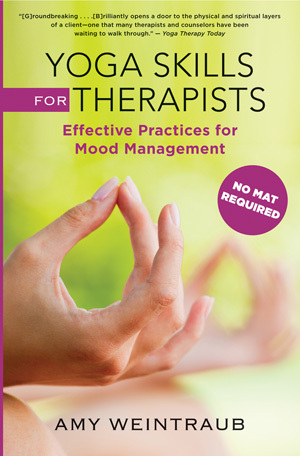 Yoga Skills for Therapists - Description | W. W. Norton & Company Ltd.
A toolkit of “no mat” yoga strategies for you and your clients. Drawing on her study of multiple traditions and lineages—from ancient yoga practices to current neuroscientific research on yoga benefits and contraindications—Weintraub presents a compendium of guided breathing exercises, meditations, self-inquiry practices, relaxation exercises, and simple postural adjustments that can readily accompany and complement psychotherapy—no mat or difficult postures required! Therapists learn exactly how to introduce these simple practices into a session, all within the comfort of their therapy room, no prior yoga training or experience necessary. Weintraub shows therapists how to introduce and apply a full range of yogic approaches: targeted breathing practices called pranayama that meet the present mood and bring it into balance; healing hand gestures called mudras; special sounds and tones called mantras; guided imagery and affirmation; yogic self-inquiry, and much more. Clinical stories and anecdotes explore how these yoga-based interventions, rooted in a firm, evidence-based foundation, can be used as effective treatments for a particular mood or mental state. With over 50 photographs that clearly illustrate the practices and gestures, detailed, step-by-step instructions, and scripts for guided relaxation and meditations, Yoga Skills for Therapists is a practical, hands-on guide that teaches the power of basic yoga techniques to bring great self-awareness, balance, and lasting well-being to you and your clients.